Hey everyone, it’s Joyce Moore. Today I’m going to give you my top tips for keeping your pet calm when you are away. How do you keep your dog calm when you’re gone? Especially, if you live in an apartment, You don’t want it barking. The number one thing you have to do. You might have to get up early. You might have to get up just a little bit early. Take your dog for a walk. Go out. Throw the ball for it in the backyard, But tire that dog out. It will be less likely to be barking and yelling when you leave. Music is a great one. 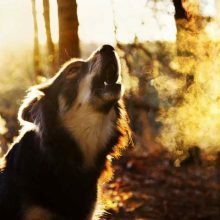 There have been several studies that have looked at dogs and their behavior while they’re being left by owners and while they’re in kennels and at the vet and not surprisingly classical music do better than heavy metal music. You probably could condition your dog to like heavy metal music – Yeah! But Overall, classical music did better. There’s a whole bunch of videos out there on YouTube that you can find that are calming music for animals. The calmer the better. Then there are a lot of supplements out there and pheromones and the thundershirt. These are things that work somewhat like drugs, but not exactly. I have talked about some of these things before. This is a collar that has a pheromone which is a chemical signal that one animal puts out that affects the behavior of another animal. This one is a collar which puts out a pheromone that the mother puts out when she’s nursing that just says to everybody, Calm down everything is okay. It’s all cool. These are two supplements I like a lot. Zylkene and Solliquin. 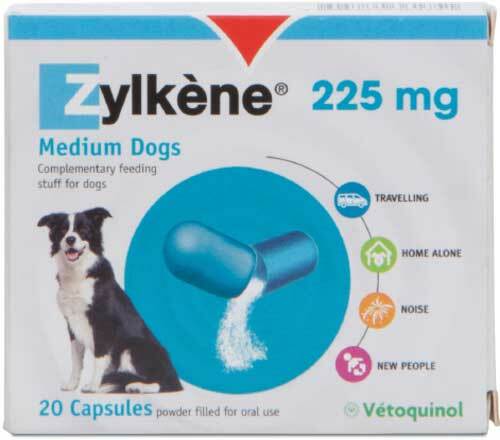 They have in them a milk protein called alpha casozepine which has been shown to decrease noise phobia in dogs. We think it works by potentiating gaba. Gaba is a neurotransmitter in the brain that’s just sort of calms everything down. You know like when you start to get nervous and you like, ‘Oh my god I’m nervous and now my heart is like beating fast and I should be nervous and I feel nervous and everything’s nervous!’ Well, this sort of calms that down. Something new that’s come out on the market recently is a plethora of, which means a lot of cameras that are like wifi cameras that can show you what your dog is doing. And some of these will even have treat dispensers so you can be away from your pet – and teach it to go up to the camera and you go, ‘oh look there you go. I’m at work but I just gave you a treat. And I got to talk to you and now my dog doesn’t care so much that I’m gone.’ There’s a whole bunch of these on the market. The nice thing about the camera is they can actually tell you how much of a problem you have. They got a wifi camera and they found out when the complaints were happening. Wasn’t their dog. It was the neighbor dog upstairs. 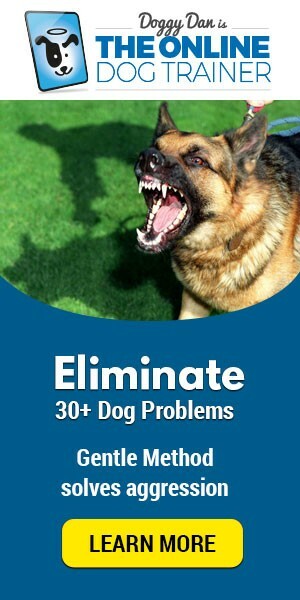 So make sure your dog actually has these problems. There are a lot of things that you can do that can make things worse or things that can make things better. Things that can make things better? Ignoring behavior that you don’t want. So if they’re really excited when you come home, kind of ignore that. Let them calm down first. Let them go, ‘Everything’s okay and calm is when I get rewarded. Oh, when you come home it’s no big deal.’ When you leave it’s no big deal. Just be calm. So those are some tips to help your pet be calm when you are gone. 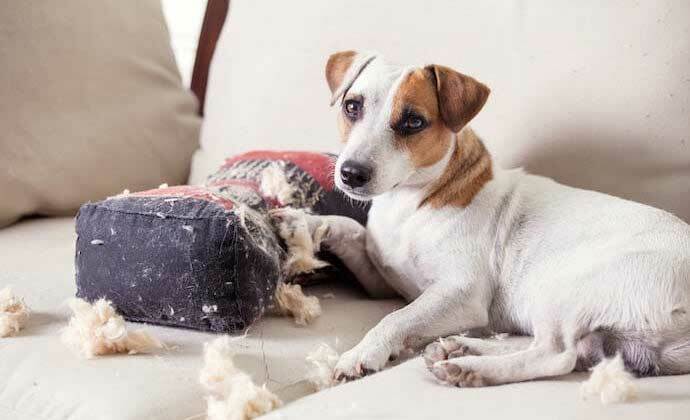 If you have serious problems, they’re doing damage to themselves or to the house be sure to visit your Professional Dog Trainer – right away. DO YOU HAVE ANY OTHER TIPS ON HOW DO YOU STOP SEPARATION ANXIETY IN DOGS? SHARE BELOW!